Mission: The Missouri State Committee of Psychologists protects the public from incompetence, misconduct, gross negligence, fraud, misrepresentation or dishonesty; licenses only "qualified" professionals by examination and evaluation of minimum competency; enforces standards by implementing legislation and administrative rules; and encourages economic development and partnerships with existing small businesses. Function: The Missouri State Committee of Psychologists may promulgate, by rule "Ethical Rules of Conduct" governing the practices of psychology which rules shall be based upon the ethical principles promulgated and published by the American Psychological Association. 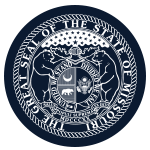 Member Requirements: Each committee member shall be a resident of the state of Missouri for one year, shall be a United States citizen, and shall, other than the public member, have been licensed as a psychologist in this state for at least three years. Committee members shall reflect a diversity of practice specialties. To ensure adequate representation of the diverse fields of psychology, the committee shall consist of at least two psychologists who are engaged full time in the doctoral teaching and training of psychologists, and at least two psychologists who are engaged full time in the professional practice of psychology.